Eleven thousand years ago the drowned valley known as the East River was formed by glaciers. For centuries, the land around the East River and the Hudson River was inhabited by the Lenape indigenous people who used the area for hunting, fishing, and farming. Europeans first settled in the area they named New Amsterdam in 1609, and the English took over from the Dutch in 1674 and renamed it to New York. Peter Stuyvesant, who had been Governor for 27 years, retired to his 62 acre farm located right next to the East River. This is the area in which Stuyvesant Town will be created, but that won’t be for another 273 years. In 1783 New York was freed from British rule after the American Revolution. During the 1800s immigrants streamed into the area and NYC was growing and developing fast. In the 1820s dry docks and shipyards were created by dumping dirt and trash into the East River. This expanded Manhattan’s coastline past the original shores. 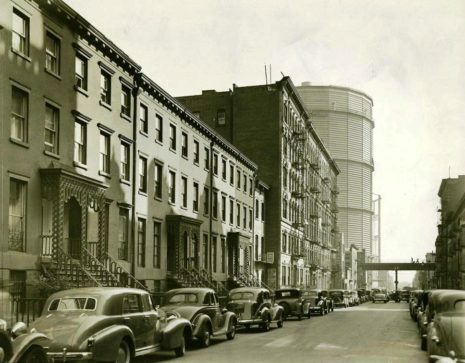 In 1842 the first gas storage tank was constructed in the future Stuyvesant Town area. More gas tanks were constructed over the next decade and the area known as the Gashouse District began to take shape. The area was a poor slum run by the Gashouse Gang of criminals who terrorized the neighborhood. The gas tanks themselves also leaked, producing a horrible smell and polluting the air, soil, and river. Starting in 1934 the City of New York began buying up parts of the surrounding area for future construction of East River Drive, now known as FDR Drive. In 1938 the concrete mixing facility owned by Transit-Mix Concrete Corporation moved from 18th street to the waterfront to make room for FDR Drive. This is exactly where Stuyvesant Cove Park will be built in 65 years. 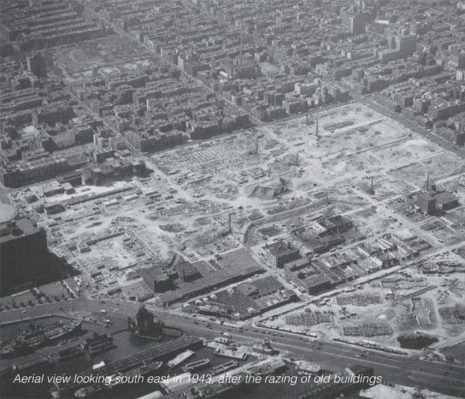 In 1942 the Gashouse District was demolished in order to build the Stuyvesant Town housing development. By 1946 all the neighborhood’s buildings had been destroyed, and more landfill was created, this time using rubble shipped as ballast from war torn London and Bristol. The next year the first buildings of Stuyvesant Town were constructed. 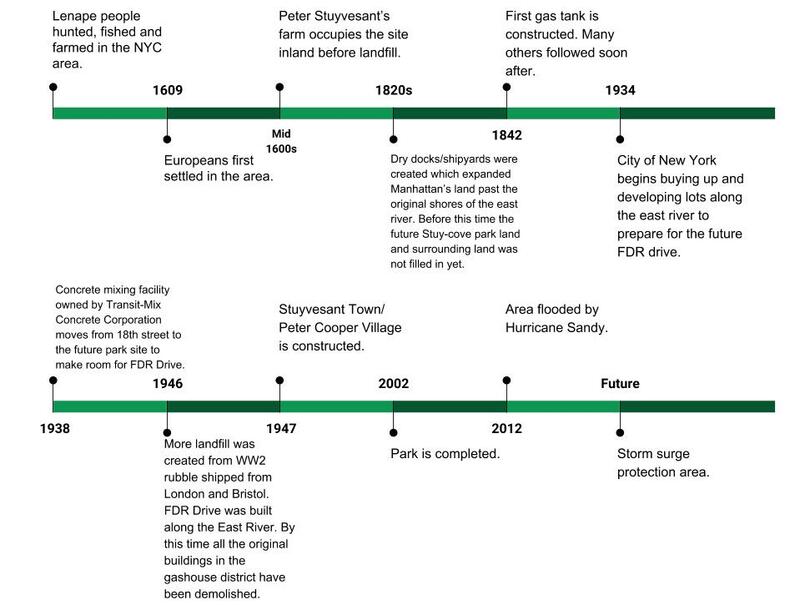 Over the years, the Stuyvesant Cove Park site was contaminated by gas leaks from the MGP, leaky fuel pipelines and holding tanks associated with local industry, and with concrete waste products dumped on land and in the river. The effects of the river dumping can be seen first hand as it has created a small beach area in the park, that is visible at low tide. All of these factors contributed to the area being classified as a “brownfield,” or a land area that has environmental contamination. The beach area created by cement dumping. 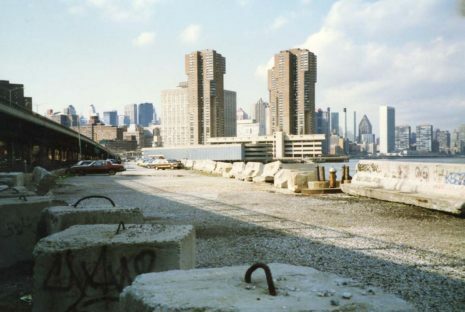 In the mid 1980s, after the cement mixing plant was demolished, plans were made to develop the site as RiverWalk, a large complex that included housing, a marina, a hotel, offices, theaters and stores. For the next decade the plan faced backlash from residents who were afraid the development would block or restrict public river access. Concerns were also raised about how the project would affect animal and plant life along the shore. In 1992 the complex was defeated, and community members began to plan what would be built there instead. The primary goal was to have a place for residents to visit the river and enjoy nature, a right many were afraid they may lose. In 2002, Stuyvesant Cove Park was built. 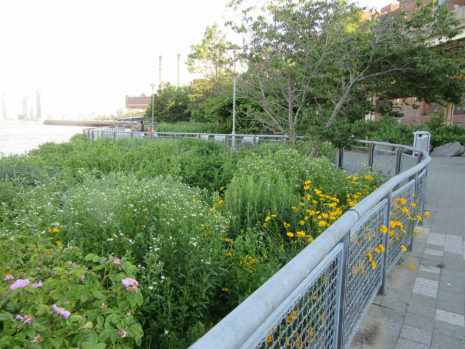 Stuyvesant Cove Park’s most unique aspect is that all plant life in the park is native. This means many of the plants that you can see in the park would have been in this region long before the city as we know it was built. The park is home to many species of bird, fish and insects. It is also a waystation for monarch butterflies. The park’s native plants are essential to the park’s wildlife, offering them vital food and shelter that non-native plants could not provide. In 2012 Hurricane Sandy hit the area hard with a storm surge of 13 feet above high tide. Floodwaters eroded park soils and killed plants, and businesses inland as far as First Avenue were devastated. Since then, there has been much discussion about how to build for resiliency, minimizing storm damage to the city. 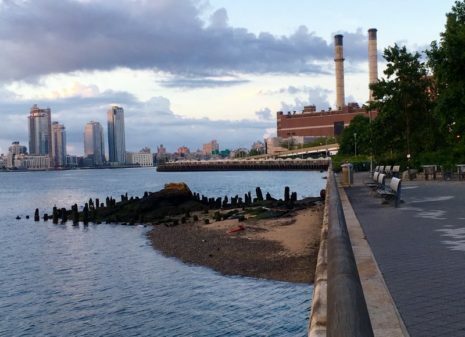 In the near future, as part of the East Side Coastal Resiliency Project, Stuyvesant Cove Park will likely be converted into a storm surge protection area, with barriers and berms constructed to prevent major flooding like we experienced with Hurricane Sandy.